Now also my third DevMaster is finished. Again with a 32bit processor with ARM7 core. 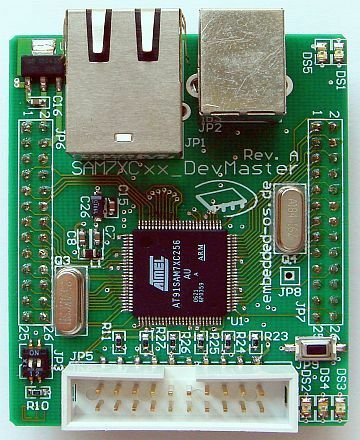 Actually this time the SAM7XCxx_DevMaster and the LPC236x_DevMaster should develop at the same time around a direct comparison between these to permit, however NXP has some problems with the update on a corrected version of its MCU's. 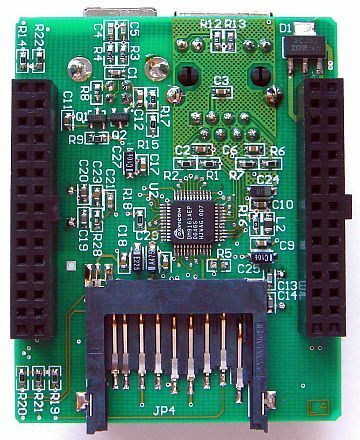 Like already with the previous DevMaster-boards probably remained due to the interface desires and compactness again only 'do-it-yourself'. The produced Header-pinning puts thus up to the Ethernet-interface all further pins of the MCU at the free disposal. And so all pins (up to the two USB pins PA2, PA7) can be used as desired as PIOs or UART,CAN,SPI,TWI,TIO,SSC, PCK,PWM,AD... for own ideas.